The Rosace team used Fieldwire to manage plans and track tasks on their extensive $513m fiber optic installation project across the Alsace region in Eastern France. There are over 450,000 projects run by Fieldwire users all around the globe, and we always love the opportunity to shine the spotlight on their efforts. One such project over in France is the SDTAN initiative, which seeks to develop a broader digital framework for people living in the Eastern portion of the country. This will close the public gap between those with digital coverage and those without, and help encourage more investment interest from private operators. Rosace, the team behind the project, is a joint venture between NGE, a heavy civil contractor, and Altitude Infrastructure, a telecom infrastructure firm. 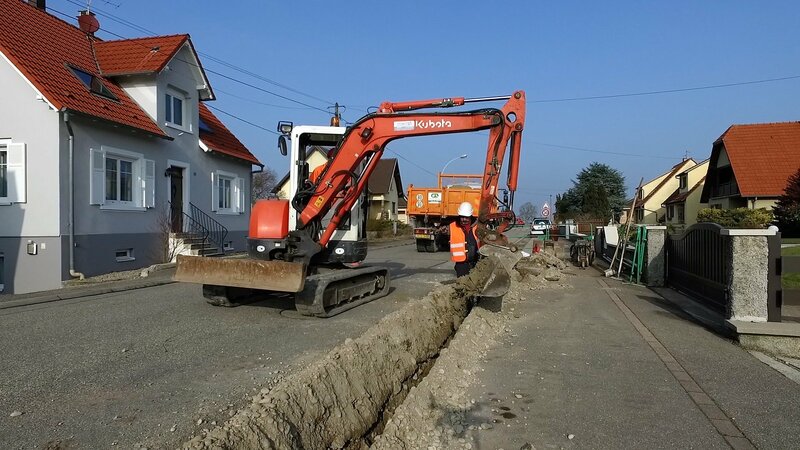 Over the next six years, Rosace will fulfill their mandate by installing a massive fiber optic network in more than 700 cities throughout the Alsace region of France. This encompasses over 3,200 square miles, and Rosace is responsible for designing, building, launching, and maintaining the entire network. By 2022, citizens and companies within the Alsace region will enjoy new, optimal coverage for cloud computing, telecommuting, and digital spaces in order to connect people both better and faster. This long-term commitment to providing a scalable fiber optic network is an enormous endeavor, but the improved internet service will more than justify the effort. Modern networking will stimulate both commerce and socialization, and this particular data system will span over 370,000 fiber optic outlets connected by 13,000 kilometers of cabling. ROSACE will deploy more than 500 workers across 80 companies to develop the network, with a total project cost of 480M€ (that’s approximately $512.5 million). With such a daunting task ahead of them, Rosace has trusted Fieldwire to help them manage the daily supervision of this expansive project. The core management team is utilizing the construction app to organize and access their plans more efficiently, and with at least one dedicated plan for each Alsace city, that’s around 700 municipal layouts to keep track of. Luckily, Fieldwire allows them to carry every plan around on a mobile device for easy reference and the ability to mark them up on the fly. Fieldwire also enables the Rosace team to manage all of their tasks with real-time notifications and comprehensive data storage. They can measure installation progress through detailed reports and handle all QA/QC issues in the app, keeping their subcontractors on track with checklists and helping them document important items with photos and notes from the field. There’s no event they cannot record and track from start to finish, which ensures that each section’s installation goes as smoothly as possible.